Solinglass Warms Cotton Mill "Incubator"
When you walk into the Solinglass studio, you can expect a warm welcome, in more ways than one. Proprietor Randi Solin is a genial host. And her studio is insanely hot. "We're people of the fire here," Solin tells me while she works. "We use it in all its forms." 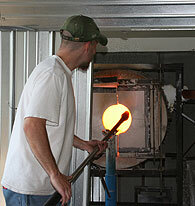 I watch Solin and her hot-glass assistants, Marie Walker and George Billesimo, work all morning. In a three-hour period, they use a glory hole, a furnace, a bench burner, several blowtorches and a set of ovens. They make one piece. 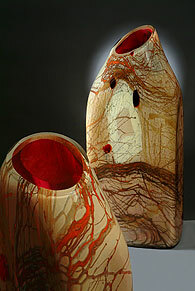 The piece in question combines two of Solin's signature vase designs -- the window flat, which uses reverse coloration to create an abstract design viewed through a miraculously clear front, and the cintura, a flat that is creased and torqued to suggest a woman's waist and hips. As I watch Solin and her crew make the cintura, I get a glimpse of the skills that have made her art and her business great. At this scale, glassblowing is always a social activity. Her quiet control makes the work flow smoothly. The crew moves and communicates constantly, but the mood is tranquil and the process fluid. There are no fragile egos, no brittle nerves. Any disappointments are shared. After the piece comes off the pipe, there is a three-way hand maneuver that is something between a high-five and a hug. "We're not production glassblowers," Solin says. "We make a couple pieces a day." This has put nary a crimp in Solin's success. Quite the contrary. Her work is in permanent collections in the White House and two United States embassies, and is currently represented in more than a hundred galleries across the country, including Brattleboro's own Gallery in the Woods. 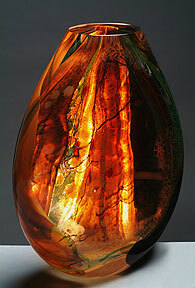 She has three full-time employees -- Walker, Billesimo and Michael Wind, the cold-glass assistant, who sands and polishes her pieces to reveal a luminescent cross-section of the layers and layers of glass. 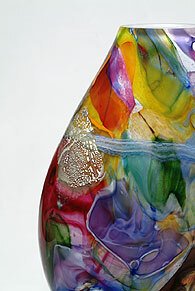 Like glassblowing itself, succeeding at business requires good strategy, careful monitoring, stamina, finesse and luck. And one of Solin's strokes of luck was the chance to participate in the small business incubator project at the Cotton Mill complex, which is owned by Brattleboro Development Credit Corporation and rented to small business owners at very low rates. "I am totally viable," Solin tells me (not before finding some wood to knock on while she says it). "A huge component of my success was having low overhead." 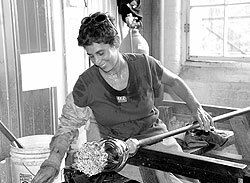 Solin, who started Solinglass in California eleven years ago, moved into the Cotton Mill complex in 1999. She was one of the first two artists to use the facility, which BDCC originally envisioned as a space for up-and-coming production companies in hopes of creating manufacturing jobs in the region. While some manufacturing companies have outgrown the Cotton Mill space and bought their own buildings -- including Chroma Technology Corp., now located in Bellows Falls -- the complex has taken a decided turn toward creative and alternative industries, including several educational and retail establishments. It houses artists, furniture makers, craft food producers, a builder of toys for children with disabilities, a trapeze school, a homeschool resource supplier, a precision turning company, a fitness center and several massage therapists. There are also performance spaces, including The Loft and the Vermont Jazz Center. "This is the creative economy at work," said Jeff Lewis, executive director of BDCC. While the project has not resulted in an explosion of industrial jobs, Lewis says, "The strategic objective is to try to make best use of industrial real estate." He is excited that the building is thriving -- there is a considerable waiting list for would-be tenants -- and that it continues to have a major role in the local economy. "We're happy to see it used this way," he said. "We've got stuff in there you wouldn't believe!" Besides reflecting and contributing to local economic trends, the space has advantages for budding business owners. Having so many entrepreneurs in one set of buildings, Lewis says, "turns out to be very useful. They enjoy talking to each other and doing things together." The business owners provide a collegial, supportive atmosphere for one another. There are more tangible advantages as well. Solin and potter Natalie Blake, whose studio is just down the hall, share shipping costs as well as resources like trucks and packing materials. And the annual open house, begun six years ago when Solin opened her studio to a few visitors, has become a large community project that brings all the Cotton Mill tenants into the public eye. Solin reports that last year more than 2,200 maps were distributed during the tour. Twenty-five businesses at the facility will open their studios, kitchens and production floors to the public this year. As the self-described "poster child" for the Cotton Mill project, Solin enthuses freely about what it has done for her now-established business. "They help us so much," she says, "They are one hundred percent supportive." And while she does not speak about her own role in the complex's success, the connection is clear. Her entrepreneurial fire has helped the Cotton Mill project become the unique business incubator it is today. All of this, of course, takes a back seat to the driving force behind Solin's business endeavors: the art itself. Love of her craft is obvious throughout the sculpting of the cintura. "We are so lucky," she says. "We get to do this all day." When she does a "gather," taking the whole piece and dipping it in clear, molten glass, Solin turns to me and says, "This is the best part. Just look at it. It's like liquid light." Perhaps remembering to feel lucky is one of the lesser-known habits of successful people. EDITOR'S NOTE: Hours for the annual Cotton Mill Open Studio & Holiday Sale are 10 to 6 on Friday, Dec. 1; 10 to 5 on Saturday, Dec. 2; and 11 to 4 on Sunday, Dec. 3. Admission and parking are free.